All of the small clay objects from the site came from the latest part of the occupation, phases D throughA. 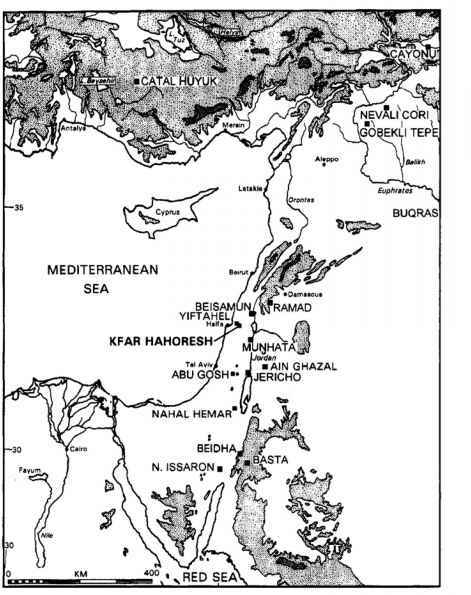 To a degree this chronological distribution reflects excavation methods rather than any change in behavior on the part cf the sixth millennium villagers. For example, phases A through D were sampled in 1968 using small picks and (sometimes) sieves in an effort to recover all types of material remains. Phases before D were excavated in 1961with large picks and no sieves in an effort to test the nature and depth of the deposit. 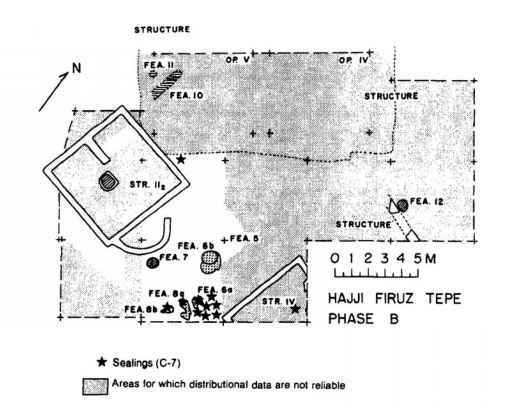 The portion of the settlement sampled for each of these phases includes a series of small freestanding houses with intramural burials, two small anomalous structures (VI and VII), and exterior areas with cooking and industrial features and trash deposits (Voigt 1983:18-94,295321). 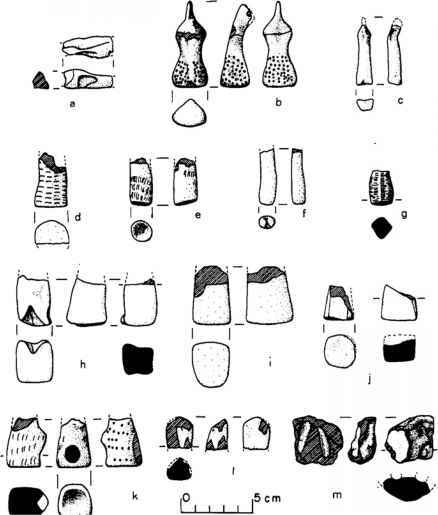 During artifact analysis, I initially divided the small, lightly fired clay bits into three categories based on form: (1) figurines of humans and animals, (2) geometrics or tokens, and (3) sealings or pieces that been impressed or modeled (Figure 1;see also Voigt 1983:175-185,Figures 101102, Plate 27, 28a-f). I then looked at the distribution of these artifacts within each of four chronological phases and found that all three classes showed some patterning; there is an overlap in the distribution of figures and sealings, but a very different distribution for geometrics (Figures 2 and 3). Ignoring tokens and sealings, individual figurine fragments are scattered within and between houses, but there is a consistent clustering in and around a series of ashy pits that I have interpreted as the remnants of bonfire kilns (Voigt 1983:69). One might be tempted to explain this distribution as the result of Sampling error: unbaked clay figures could have been widely distributed within the site, but the only examples recovered were those that happened to fall into a fire and were therefore preserved. While this bias in the sample is possible, it does not explain the entire set of actions documented by these artifacts. The figures were always broken, and in only one case were two halves found; moreover, the breaks were not at points of structural weakness, suggesting deliberate breakage and separation of the two halves (Table 1). We therefore have evidence for manufacture and destruction of figurines, perhaps in the same areas as they had been made or at least fired. Finally, most of the lightly baked figures have a delicate surface, but little or no damage to that surface. The sample is small but consistent. Figure 1. 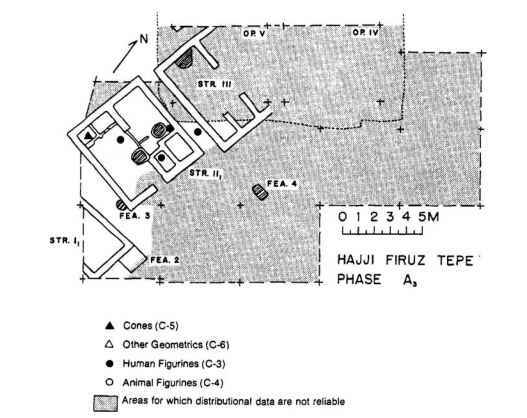 Figurines from Hajji Firuz Tepe (based on Voigt, 1983:Figure 101). 1Figurines have been used in social and economic transactions as symbols of a contract, but this usage is relatively rare and is considered unlikely within Neolithic societies (see Nickerson 1979 and Talalay 1993 for discussion of figurines as contract). 1. Cult figures, or representations of supernatural beings used primarily as symbols or objects of worship — formal, usually community rituals. 2. Vehicles of magic, or figurines used in rituals intended to produce, prevent or reverse a specific situation or state (increased fertility, healthy children, protection of property or crops, harm to one's enemies). 3. Teachingfigures, including those used in initiation rites to teach adolescent children the proper kinds cf behavior. 4. Toys, or figures used in entertainment or children's play; the adult equivalent would be ornaments for decoration or aesthetic effect. Ucko then listed the morphological attributes that characterized each group cf ethnographic figures, as summarized in Table 2. Using form as a means of understanding the Hajji Firuz figurines was a discouraging experience. They were simple and similar, with blocky bases and pinched heads. Applying Ucko's attribute sets suggested that we had only one or two functional classes. We could eliminate use of the Hajji Firuz figurines in initiation ceremonies, but form alone was of little use in deciding whether the Hajji Firuz figures were associated with ritual or entertainment. To resolve this question I returned to the distributional data.